The differences that exist between men and women extend to their attitudes towards investing. From their attitudes towards working with professional advisors to their willingness to risk portions of their portfolio for greater return, men and women approach the matter of investing with unique plans and goals. Our newest white paper High Net Worth Men Vs. Women delineates those differences. By examining responses to a series of questions related to investing strategies and aspirations, the study points out the differences between men and women in key investing areas. Women, for instance, have a greater desire to work with a financial advisor. 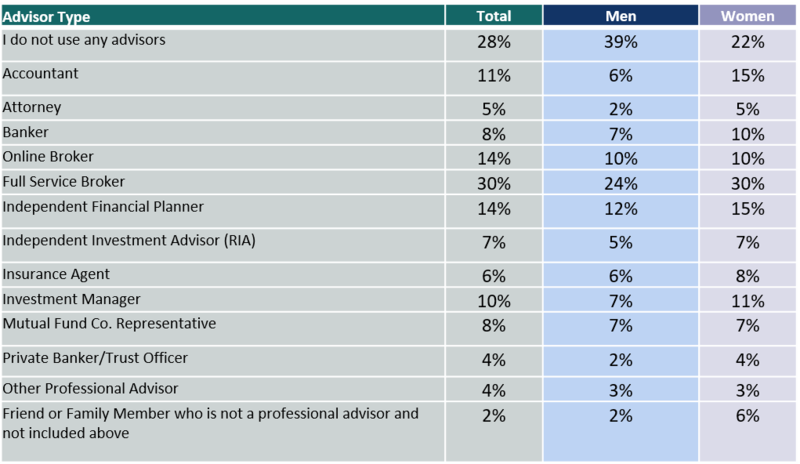 While 78 percent of female investors work with an advisor, only 61 percent of males do so, and 36 percent of women consider themselves either Advisor-Assisted or Advisor-Dependent while only 31 percent of males do so. Part of that willingness to work with professionals relates to the willingness of female investors to admit they are lacking in financial investment knowledge. More than one-third of female investors indicate they are not at all knowledgeable or not very knowledgeable about financial products and investments, while only 15 percent (almost 20 percent fewer) men acknowledge their lack of knowledge. Women also express less interest in the daily management of investment accounts. While 50 percent of male investors say they like to be actively involved in day-to-day participation in their investments, only 36 percent of female investors agree. Perhaps due to the increased or more frequent dependence on advisors, female investors report a higher degree of overall satisfaction with their advisors in terms of knowledge, responsiveness and most notably performance (74 percent of females to 66 percent of males). When it comes to risk, 55 percent of females prefer a guaranteed rate of return on the majority of their investments, while only 46 percent of men agree. Forty-four percent of male investors are willing to take risk on a portion of their investments in order to gain a greater rate of return, while only 30 percent of women are willing to do so. However, it seems women are more thoughtful in regards to their investments. Eighty-seven percent of females consider the reputation of companies they invest in, while only 78 percent of males do so. Also, 79 percent of females consider the past track record of individual investments while only 69 percent of males do so. The largest disparity is in investing with an eye toward social responsibility. Forty-four percent of women consider a company’s social responsibility while only 24 percent of males do so. Gender differences in investing must also be a consideration when dealing with a married or cohabitating couple. While they may be making investment decisions together, it is wise to make certain both voices are being heard and considered before a final decision is reached.